Director – Rob Reiner, Screenplay – Andrew Scheinman & Alan Zweibel, Based on the Novel by Alan Zweibel, Producers – Rob Reiner & Alan Zweibel, Photography – Adam Greenberg, Music – Marc Shaiman, Special Effects Supervisor – Terry D. Frazee, Production Design – J. Michael Riva. Production Company – Columbia Pictures/Castle Rock Entertainment/New Line Cinema. Eleven year-old North is a perfect student in all areas but is depressed because his parents have no time for him. And so he takes them to court and successfully divorces them. He is given a set time to find a new set of suitable parents so he embarks on a worldwide quest where parents of various nationalities solicit to adopt him. However, North has given children everywhere a newfound freedom to stand up to their parents. North’s best friend Winchell whips this up into a political and media empire but then realises that his position is founded on North never reconciling with his parents. Rob Reiner is best known as director of big commercial and critical successes such as Stand By Me (1986), The Princess Bride (1987), Misery (1990) and A Few Good Men (1992). 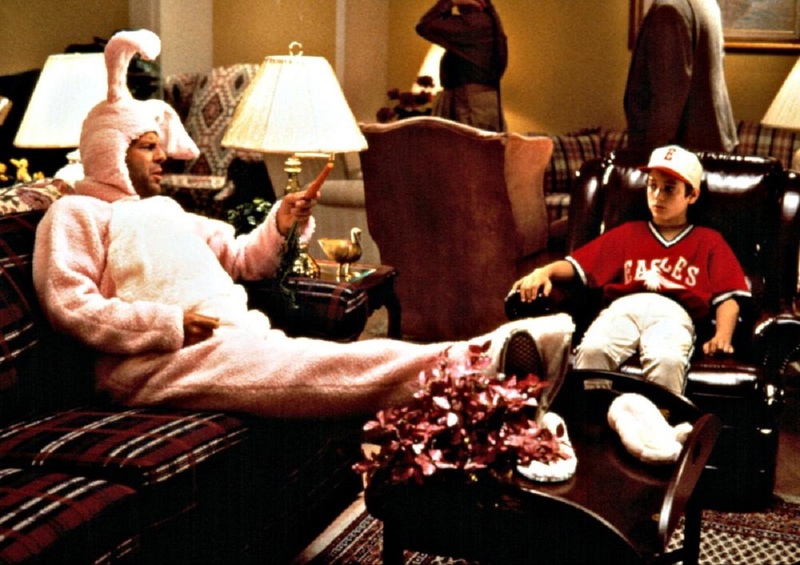 North is the only real flop that Reiner has had so far – a good deal of which seems to centre around the image of Bruce Willis as the Easter Bunny – it was even (somewhat unfairly) nominated for a Golden Raspberry Award the year it was released. North is a likeable film, even if it is probably the slightest that Rob Reiner has made. Reiner launches into with an appealingly surreal visual sense. The world tour he takes us on crafts a kind of fabulist adventure out of amusingly exaggerated versions of national images – in Texas, everything is bigger with stretch-limos the size of railway carriages; in Paris, every tv channel North flips to is showing Jerry Lewis movies; and most amusingly of all is the trip to Alaska where the igloos have picket fences and mailboxes carved out of ice, where people mow snow lawns and the igloo interiors have fireplaces and lift-up fishing holes in the floor surrounded by armchairs. (In an amusing in-joke, a brief sojourn to an Amish community features Kelly McGillis and Alexander Godunov as North’s prospective parents – both of course having played in the serious Amish movie Witness ). Reiner maintains an enjoyable sense of eccentrically akilter deadpan humour throughout which makes for a rather likeable film. Matthew McCurley gives a highly amusing performance as the Machiavellian adolescent Winchell. Rob Reiner’s other genre films are the swashbuckling fairytale parody The Princess Bride (1987) and the Stephen King adaptation Misery (1990) about a writer imprisoned by a psychopathic fan. Reiner’s production company Castle Rock (itself named after a town in Stephen King’s novels) has become a major Hollywood production company and has produced several King adaptations including Misery, Needful Things (1993), The Shawshank Redemption (1994), Dolores Claiborne (1995), The Green Mile (1999), Hearts in Atlantis (2001) and Dreamcatcher (2003), and other genre efforts such as the remake of Lord of the Flies (1990), the cryogenic sleeper film Late for Dinner (1991), the lame time travel comedy The Spirit of 76 (1991) from Rob Reiner’s son, Mel Brooks’ spoof Dracula: Dead and Loving It (1995), Kenneth Branagh’s Hamlet (1996), Lost Souls (2000), Eddie Murphy’s sf flop The Adventures of Pluto Nash (2002), the Sandra Bullock psycho-thriller Murder By Numbers (2002) and The Polar Express (2004).